If you're taking the very big step of getting married, it can be an exciting time and there's a lot to do! But one of the very first things you'll need to do to get married in North Carolina is getting a marriage license. Regardless of the county you're in, the process and necessary materials are going to be the same. Fortunately, it's not a difficult process. It's best to handle this about a month prior to your wedding. Both the bride and groom need to appear in person at their county of residence's courthouse or the county where the ceremony will be officiated. If one of the parties is unable to appear, the other party must appear in person and present a sworn, notarized affidavit from the other member. Affidavit forms are available in the Register of Deeds office. Present a current, valid government-issued photo ID, such as a driver's license, passport, and Social Security cards. Complete a marriage application form. If the bride or groom has been divorced, they must know the month and year of the last divorce. If there has been a divorce within the last 60 days, the state requires a copy of the divorce decree signed by the judge. North Carolina law requires all applicants to show proof of a Social Security number, such as a W-2 form, a payroll stub, or a statement from the Social Security office stating their Social Security number. If a Social Security number has never been issued or the applicant is not eligible for a Social Security number, the applicant will be required to present a completed affidavit, signed and notarized, at the time of applying for the marriage license. The affidavit form is available in the Register of Deeds Office. A marriage license in North Carolina is valid for 60 days and may not be used out of the state. Marriage ceremonies can be either religious or civil. A civil ceremony is conducted by a magistrate. Both civil and religious ceremonies require two witnesses. Do you need to be a North Carolina resident to get a marriage license in North Carolina? You do not. How old do you have to be? The current legal age of marriage in North Carolina is 18, although 16- and 17-year-olds can marry with parental consent, and 14- and 15-year-olds can marry with a court order. What do you need to do if you change your name? If you change your legal name, you'll need a certified copy of your marriage certificate to change your driver's license and Social Security card. Does North Carolina have common law marriage? North Carolina does not have common law marriage (living together and taking the same name). 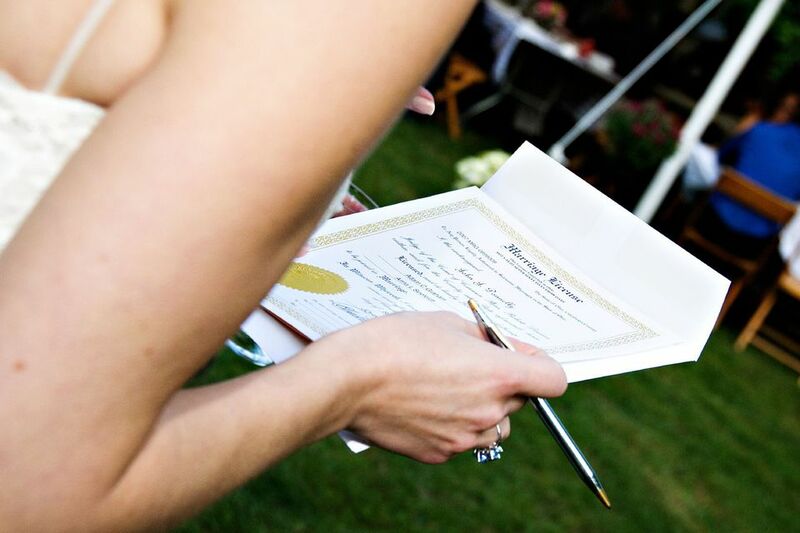 In this state, you must obtain a license and have a ceremony (civil or religious) to be considered married. Is a blood test required? No. In previous years, a blood test and a physical were required, but that's no longer applicable. Is there a waiting period for a marriage license? There is not. Licenses are valid immediately. Are there any restrictions on getting married in North Carolina? There are a few. Both the bride and groom cannot be presently married. If one or both parties are in the process of getting divorced, that process must be final before a license is issued. Also, the bride and groom can have no closer family relationship than first cousin (first cousins can marry in North Carolina).